Why should you start a business in South London? With a swelling population of over 1.7 million people, in recent years South London has been drawing in more and more start-ups with its competitive office premise costs, rates relief, and thriving business support. After North London, South London has one of the highest proportion of micro-businesses (0-9 employees) in London with micro-businesses accounting for 92.5% of total enterprises across the Bromley, Croydon, Merton, Sutton, Lewisham and Wandsworth areas. Croydon in particular has become a go-to start-up destination for entrepreneurs, especially those in the media and technology sectors. A 2015 report from Croydon Council confirmed that Croydon is the capital’s fastest growing tech cluster with 23% growth in new tech and digital companies since 2011; higher than the London average (17.1%) and the UK as a whole (11.3%). Said to be South London’s answer to Silicon Valley, ‘Croydon Tech City’ is home to a large entrepreneur and developer community and has a range of support initiatives; one of its most well known is its ‘free for a year campaign’ which offers Grade A office stock with free business rates for the first year to any tech and digital start-ups which move to the borough. But it’s not just Croydon waving the flag for enterprise in South London; Sutton also offers a similar level of support. Opportunity Sutton offers 50% off business rates for the first year of trading for eligible new businesses that start or relocate to the area and it also boasts a programme of business resources through its Enterprising Sutton arm. Benefiting from close proximity to Gatwick and Central London, South London has good transport links to the the rest of London and the UK. Bromley and Croydon benefit from overground links to East London and the London Underground Network and Bromley South Station and Bromley North have services to London Victoria, London St Pancras, London Bridge and Charing Cross. Bromley even has its own airport, Bromley Biggin Hill, located in the borough. Prime office stock is surprisingly easy to come by in South London with each borough boasting a wealth of flexible workspaces and commercial premises. Matthew’s Yard in Croydon draws attendees from London, Surrey and beyond and incorporates a workspace, gallery, café and a theatre. 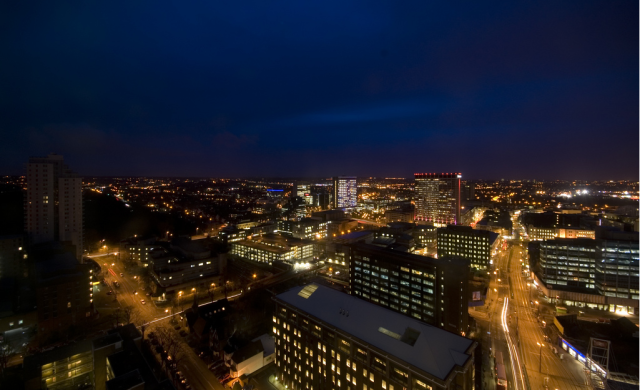 Croydon is also home to co-working offices such as Capital Business Centre. As part of its funding from the 2012 Portas Pilot Scheme, Croydon’s Old Town is also under development so you can expect a mass of new workspaces in the future. In Wandsworth there’s office space available at Workspace Group, Putney’s Co-Work and 1 Hardwick’s Square, to name a few. Over 51% of those that live in the South London area have NVQ Level 4 qualifications and above; higher than the averages for North and East London; making the South an attractive place to start-up for hiring needs. The vast array of apprentice programmes, business training and events ran by several colleges and universities in the areas adds to its appeal. With campuses for the University of London in Lewisham for those in the arts and fashion and the University Centre Croydon, starting a business in the South of the capital would enable you to tap into this talent. Colleges in the area also lend their support towards start-up enterprise; Croydon College hosts events to highlight the support available, Wimbledon College of Arts offers business training and Bromley College has training programmes and apprenticeship schemes through its Capital B project that help to connect companies to talented students. Other initiatives to help local business source talent includes Croydon’s local employment creation scheme which provides up to 80% wage subsidies plus an additional £1,000 bonus for job retention to businesses hiring new staff, alongside Lewisham Council’s apprenticeship programme. Business support varies across the South London boroughs but there is a lot on offer to new businesses from library resources and start-up grants to accelerator schemes and networking events. In Lewisham there is popular incubator scheme, Cockpit Arts, which is targeted at early-stage creative businesses while in Sutton there is the SHINE business incubator; a Hub for Innovation, Network and Entrepreneurship ran by SCOLA Sutton college which incorporates a full programme of one-off business support seminars delivered by “area experts”. Similar support is provided in Merton where there is The Generator business centre run by the Merton Chamber of Commerce which offers high quality office and industrial space alongside access to onsite business advisers, training, events and workshops. If you live in Croydon and start a new business in the area then you may be able to borrow up to £5,000, with interest fixed at 5.02% via its Loan Finance incentive. Croydon is also particularly good for social enterprises offering an interest free loan of between £10,000 to £30,000, a business mentor from Legal & General and access to expert advice to social businesses through SE Assist. In Merton, new businesses with growth potential can access loans of between £10,000 to £22,000 from the Merton Business Loan Fund provided that you can show a viable business plan and evidence that you are unable to raise funding from banks and other commercial sources. Business loans of up to £22,000 are also on offer for new and growing start-ups in Wandsworth through the Wandsworth Business Loan Fund, created in partnership with Wandsworth Council and GLE oneLondon, which aims to provide a new funding option for the borough’s small and medium companies that have been turned away from mainstream lenders. Start-up businesses looking to network with like-minded entrepreneurs are in luck when it comes to the range of networking events in South London. Croydon holds regular social events with groups such as ‘Croydon Creatives’ and Croydon Tech City’s fortnightly meet-ups. Bromley in particular hosts a variety of business events through groups such as The Bromley Business Club, The Women in Business Network (operates across South East England) and BNI Churchill which is a business breakfast network for entrepreneurs to pass on leads to generate more business. A full list of Bromley events can be found here. Sutton Chamber of Commerce runs regular events which include open days and one-to-one advice clinics and Wandsworth Chamber of Commerce has an extensive portfolio of events which include women’s dinners and digital conferences. While Bromley doesn’t have a specific business library, it offers business services via its main library. Croydon Central and Thorton Library run national careers service Learning Curves which is useful for businesses looking to attract new talent and Lewisham library also has online business resources which are available here. Although not a library resource, Wandsworth Chamber of Commerce also offers a series of resources and updates for business in the area through its Open4Business newsletter. House prices in South London are pretty reasonable for the area – £465,288– and South London also has the lowest council tax rates which is partly due to Wandsworth having the second lowest council tax in the capital (£674.22) which makes the area a good option for start-up entrepreneurs. Crime rates in South London are about average for London with 118,086 total crimes committed across 2015, according to Metropolitan Police statistics, but crime rates are highest in the boroughs of Croydon (29,081) and Wandsworth (22,828) with violence against a person, motor vehicle accidents and domestic crime among the most common offences. Crime rates are lowest in the boroughs of Sutton and Merton but this is also tied to the fact that they have much smaller populations. With regards to socialising and eating out, South London has its fair share of bars, restaurants and attractions. Bromely is home to niche pubs such as The Bickley and Late Knight’s Brewery and fine Indian dining at Cinnamon Culture, while in Croydon entrepreneurs can unwind at The Cronx pub and in Wandsworth, Clapham’s Nortcote Road is an ideal location by day and night with numerous bars and restaurants such as The Holy Drinker and local cafe favourite Boiled Eggs and Soldiers while in Clapham Common you can dine at Trinity; ‘Clapham’s best restaurant’ (Time Out 2014). Speaking of daytime, Sutton is home to gorgeous parks such as Manor and Grove Park and even has a community farm, a green fair and its own ecology centre so would be ideal for any up-and-coming sustainable businesses. Shopping destinations can also be found at Croydon’s two shopping centres, Lewisham Shopping Centre and Bromley market, among various others. For cultural attractions, Croydon is home to the Croydon Clocktower arts venue and museum of Croydon while Lewisham boasts a free-to-enter museum. The distillery start-up tells us why accessibility, a growing business network and venture support make South London great.